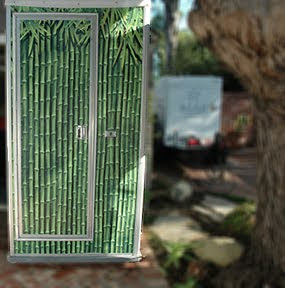 We recently wrapped a porta potty in custom graphics for a wedding in Santa Barbara. We were contacted by an event management company out of New York that put together the wedding plans, and they asked if we could wrap the bathroom in custom graphics, similar to a vehicle ad wrap. The graphics were printed on a Busmark material using our Mimaki JV-3 Digital Screenprinter. This process is ideal for temporary projects which will be up for less than one year, and is quite cost effective. The graphics came out great and the installation allowed us to fine tune the measurements to achieve a perfect fit. 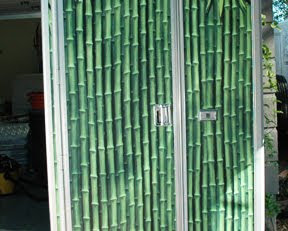 The bamboo images created the perfect atmosphere for the upscale portable bathroom.